Wrestling has been popular throughout recorded history. Origins of the sport can be traced back 15,000 years through depictions in cave drawings in France. Early Egyptian and Babylonian reliefs depict wrestlers using most of the holds known to the present-day sport. It is amazing to think that your sons and daughters are being taught the same moves that have been taught for thousands of generations. In ancient Greece, wrestling occupied a prominent place in legend and literature; wrestling competition, brutal in many aspects, was the supreme contest of the ancient Olympic games. The ancient Romans borrowed heavily from Greek wrestling, but eliminated much of its brutality. During the Middle Ages (5th century to 15th century) wrestling remained popular in Europe, and enjoyed the patronage of many monarchs. Royal houses in Japan also supported the sport. Early North American settlers brought a strong wrestling tradition from England to their new home. The colonists also found wrestling to be popular among Native Americans. Amateur wrestling flourished and was a popular activity at country fairs, holiday celebrations, and military exercises. In modern times wrestling has lost some of it’s luster, living in the shadow of more popular sports such as football, baseball and basketball. Unfortunately its theatrical evil-cousin “professional” wrestling has also overshadowed the art form of true wrestling. Wrestling is a sport in which two combatants try to control one another over the course of a set amount of time, within a defined set of rules, supervised by a knowledgeable Referee. The ultimate achievement in a wrestling match is to hold an opponents shoulders to the mat for a brief moment (this is called a “fall” or “pin”). Holds and movements are used to control one’s opponent, thus scoring points throughout the match. Both wrestlers are allowed to score points at any time in the match. If neither wrestler can score a fall within the time limit, the competitor with the most points wins the match. Wrestlers compete in weight classes, which ensures that opponents are of approximately the same size and weight. All sanctioned wrestling matches are to be supervised by a Referee, who enforces the rules. There are three basic styles of amateur wrestling, differing in how points are scored and other rules and regulations. Freestyle and Greco-Roman are contested on the international level. Collegiate-style (also known as folkstyle) is specific to North America, and is the style used in high school and college wrestling. Wrestlers must wear a close fitting one-piece uniform known as a singlet, and light heelless shoes that are laced above the ankles (and then taped around the laces). Headgear is also mandatory to protect the wrestler’s ears. Hair must be cut above the top of an ordinary shirt collar in the back, and sideburns and hair must be above the bottom of the ear lobes. Wrestlers may have long hair, however, they must tie their hair back and hold it with a hair cap. Wrestlers must be clean-shaven, though a neatly trimmed mustache is permitted. No jewelry may be worn. High school wrestling matches consist of three two-minutes periods. A one-minute, "sudden death" overtime period is wrestled if the score is tie at the end of regulation time (the first person to score in overtime is automatically the winner). An official time keeper keeps track of the time, starting the clock on the Referee’s whistle and stopping the clock if the combatants go out of bounds, the period ends, or an injury occurs. A wrestling Referee (or Official) has full control of each match and his or her decisions are final. Referees make decisions based on the rules and guidelines found in the National Federation High School Wrestling Rules Book. The Referee’s chief concern is the health and safety of the wrestlers. During a match the referee starts and stops the match using a whistle. He or she will indicate which wrestler has the position of advantage, and will hold up fingers to indicate how many points the wrestler is to be awarded. The match starts with both opponents on their feet facing one another. Wrestlers are assigned a color (red or green), which they wear as a band around their ankle for easy point identification between the Referee and scoring table. As a show of sportsmanship, the competitors will be asked to shake hands, place their feet on a green or red line (according to the color of their anklet), and upon the Referee’s whistle wrestling begins. Once the match is over both wrestlers must return to the center 10-foot circle and shake hands as the Referee declares the winner by raising his or her hand. Wrestling is practiced and conducted on a regulation pad, called a "mat", which is to be no less than one inch thick. A center circle of ten feet in diameter is where competition starts, an outer circle of 28 feet notes the out of bounds area. During the course of the three periods, wrestlers will be in several different positions, including neutral, top and bottom. The first period always begins with the wrestlers on their feet in the neutral position. At the end of the first period the Referee will flip a colored disk to determine which wrestler gets to choose their preferred starting position for the second period. That wrestler has the choice of neutral, top, bottom, or they may defer their choice to the third period. Whichever wrestler did not get choice of position in the second period will get choice of position in the third period. If both wrestlers are on their feet, facing each other, and neither is in control; they are in the neutral position. From this position the wrestlers will use stance, motion, level changing and penetration to wrestle their opponent to the mat. At the start of the second period, or if a takedown occurs and wrestlers go out of bounds, the wrestler on the bottom will assume a proper down position in the center of the mat. Two parallel lines on the mat designate where the bottom wrestler must set-up (hands in front of the top line, knees behind the bottom line). Once the wrestler on bottom is set, he or she may not move until the whistle blows. The defensive wrestler can score by cleanly escaping from their opponents grasp, or reversing their opponent and gaining topside control. The wrestler in the top position must wait for the Referees signal before he or she sets-up on top. The top wrestler may start on either side of their opponent, with at least one knee on the mat, and their head in the middle of their opponent’s back. The top wrestler then places their inside hand on their opponent’s elbow and far-side hand loosely around their opponent’s waist. An optional starting position allows the topside wrestler to start by standing with both hands on their opponents back. During the match the Referee will make sure that both wrestlers try to stay in bounds (within the outside circle on the mat). When a supporting part of both wrestlers is out of bounds, the Referee stops the wrestling and the wrestlers return to the center of the mat. The wrestlers will then start in the top, bottom or neutral position, according to what position they were in when they went out of bounds. The objective of wrestling is to pin your opponent's shoulders to the mat for 2 seconds. A pin (a.k.a. fall) ends the match immediately. However, if neither wrestler is pinned, the winner is the wrestler with the most points at the end of the match. There are five ways to score points in a folkstyle wrestling match: Takedown, Escape, Reversal, Near-Fall, and Penalty. A takedown is scored from the neutral position, when one wrestler gains control of his or her opponent on the mat. There are many ways to take an opponent down, including attacks on an opponents leg(s), arm(s), or body. Takedowns can also occur after defending oneself from such an attack. Once again, both wrestlers are able to score at all times during the match. An escape occurs when a wrestler, who is in a defensive position on the mat, is able to break free of an opponent’s grasp and moves to a neutral position. The most common way to achieve an escape is to do a stand-up. The wrestler must break cleanly from the opponents grasp to earn the point. Points for a near fall are awarded when a wrestler has control of his or her opponent in a near pinning position for a certain amount of time. A near fall occurs when the defensive wrestler is in one of the following positions: 1) both of his/her shoulders are restrained four of fewer inches from the mat, 2) one shoulder is touching the mat, with the other shoulder at a 45° angle to the mat, or 3) he or she is in a high bridge (arching backwards on head and feet), or supported on both elbows. If near fall criteria is met for the Referees count of two seconds, the near fall is worth two points, if the near fall occurs for five seconds or more it is worth three points. An offensive wrestler may not score two consecutive sets of near fall points with the same hold. A wrestler is awarded point(s) for technical violations or infractions of the rules committed by his opponent. There are three ways for a wrestling match to end, as described below. If the score is tie at the end of regulation time, there is a one minute "sudden death" over time period and if neither wrestler scores during the overtime period, a special 30 second double overtime period is wrestled. As described earlier, a pin is awarded when a wrestler holds his or her opponent’s shoulders (or scapulas) to the mat for two consecutive seconds. No matter how much time has elapsed in the match, if a pin occurs, the match is over. Pins have happened as fast as 5 seconds into a match, and at the 5:59 mark. A pin, like a home run in baseball, adds excitement to the sport, since either wrestler can win the match at any time, no matter what the scope is. A technical fall is awarded, and the match ends, when a wrestler has a 15- point advantage over his or her opponent. A match will continue if the winning wrestler scores the last points by turning his or her opponent on their back, in order to giving the superior wrestler a chance to pin his or her opponent, and thus earn more team points. If the match goes through the end of six minutes (three two-minute periods) and a fall or technical fall have not occurred the wrestler with the most points wins the match by decision. If the score is tie at the end of regulation time, a one-minute "sudden death" over time match begins with both wrestlers in the neutral position. The first wrestler to score a point wins the match. If neither wrestler scores in the one minute overtime period, there is a 30 second tiebreaker. The wrestler who first scored a point in the match gets the choice of starting in the top position or bottom position (if neither wrestler scored a point, a disk is flipped to decide who gets choice). In the final 30 seconds both wrestlers try to score, however if the wrestler on the bottom does not escape or reverse, the top wrestler is declared the victor. Default: a wrestler is unable to continue wrestling for any reason. Disqualification: a wrestler is removed from participation for flagrant misconduct, unsportsmanlike conduct, or for an accumulation of penalties. Forfeit: a wrestler fails to appear on the mat ready to compete, or is not fit to compete (due to injury). Teams will also receive points if the opposing wrestler has forfeited, defaulted, or been disqualified for any reason (6 points in a dual meet, 2 points in a tournament). Misconduct, or unsportsmanlike conduct by a coach will result in the loss of team points. Wrestling is a contact sport, so it is necessary to use body weight as a measure that each wrestler is competing with opponents of approximately the same size. We do encourage a good, healthy weight control program that involves parents, coaches and athletes. This program includes a healthy diet, lots of exercise, and plenty of rest. Before January 15th, each wrestler is required to establish a certified minimum weight. A wrestler cannot re-certify at a lower weight during the season. He or she also cannot weigh-in more than one weight class above his or her certified weight, without re-certifying at a higher weight. A two- pound "growth" allowance is added to each weight class after January 15th. Wrestlers weigh-in 30 to 60 minutes before a dual meet is scheduled to begin; 1 to 2 hours prior to the start of a tournament. When there are consecutive days of team competition, all wrestlers are granted an additional one-pound allowance each day. Illegal holds are dangerous and thus if an illegal hold is used, the Referee will immediately stop the match and award one point to the offender’s opponent. Some (but not all) illegal holds are described below. SLAM: Lifting and bringing an opponent to the mat with unnecessary force. It is the responsibility of the lifting wrestler to return their opponent safely to the mat. HAMMERLOCK: Pulling an opponent’s arm to high on his back or pulling his arm away from his back. HEADLOCK (WITHOUT AN ARM): Locking arms or hands around an opponent’s head without encircling an arm. FULL NELSON: Locking hands under both arms and on top of opponent’s head. INTENTIONAL DRILLING: Forcing a defensive wrestler who is standing to fall back forcibly to the mat. Other illegal holds include bending, twisting, or forcing a wrestler’s head, knee or limb beyond its normal limits of movement, pulling back a thumb or finger, and/or using any hold as punishment. Some holds are not illegal, but they are potentially dangerous. Potentially dangerous holds occur when a body part is forced to the limit of its normal range of movement. The Referee will caution a wrestler against forcing a potentially dangerous hold into an illegal hold; however, he or she will not stop the wrestling action unless it is necessary to prevent an injury. Technical violations include assuming an incorrect starting position, false start., the grasping of clothing or headgear, locking hands in the top position, spitting, cursing, and leaving the mat area without the Referee’s permission. A technical violation may be given as a caution or as a penalty point, depending on the infraction. 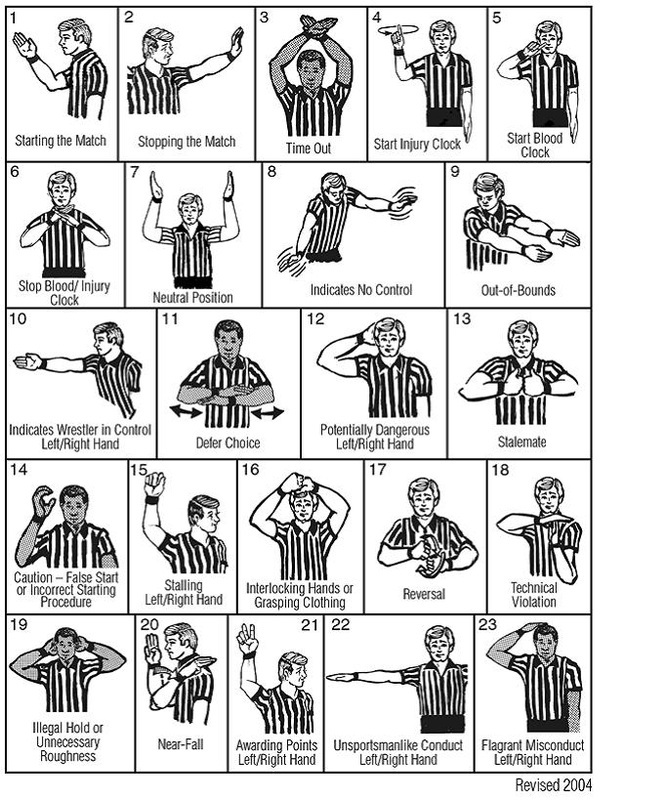 When a Referee witnesses one of the following conduct infractions he or she will take appropriate action. When a wrestler does not wrestle aggressively; continuously avoids contact with his opponent; plays the edge of the mat; delays the match; prevents his opponent from returning to inbounds area; is not attempting to secure a takedown. A wrestler will be warned one time and is penalized on each successive stalling infraction. Physical acts that exceed normal aggressiveness such as a forearm blow to the back or head. An offending wrestler will be penalized one point. Any unsportsmanlike physical or non-physical act occurring before, during or after a match. These acts include failure to comply with the directions of the Referee, shoving, swearing, taunting, baiting and opponent, throwing headgear and spitting. An offending wrestler is penalized one point for such infractions. Any physical or non-physical act occurring before, during, or after a match that’s considered serious enough to disqualify a contestant. These acts include biting, hitting, head butting, elbowing, or kicking an opponent. Penalty points and warnings (cautions) are cumulative throughout the match and the overtime period. The wrestler’s opponent is awarded one point for a second caution or for a first infraction, one point for an additional infraction, two points for a third offense, and disqualification for a fourth offense. Injury time-outs are cumulative throughout the match and overtime. A wrestler is limited to two time-outs totaling one and a half minutes. The Referee determines the number of bleeding time outs. If the bleeding is not controlled within five minutes, the match is terminated and the opponent is awarded the match by default.